All our windows and doors can be made with double glazing. This helps cut down on heat loss and noise from outside. 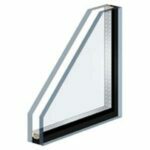 The double glazed units can be gas filled to your specification and have U Values as low as 1.2. They can also be made with a 7mm sightlines that allow elegant, traditional fixed glazing bars to preserve the period character of the building, whether listed or within a conservation area. Most units also have a 5 year manufacturer guarantee. Glass: 4mm Clear, softcoat, 4mm toughened, 6.4mm laminated, Sandblast and a range of pilkington pattern glass.